Artists have been questioning the role of the copy in contemporary art for decades, particularly following Walter Benjamin's iconic text The Work of Art in the Age of Mechanical Reproduction (1936). In this solo exhibition Kenny Hunter opens up the debate in relation to contemporary sculpture, arguing that reproduction is an ongoing creative process rather than a series of meaningless repetitions without the 'aura' of an original. 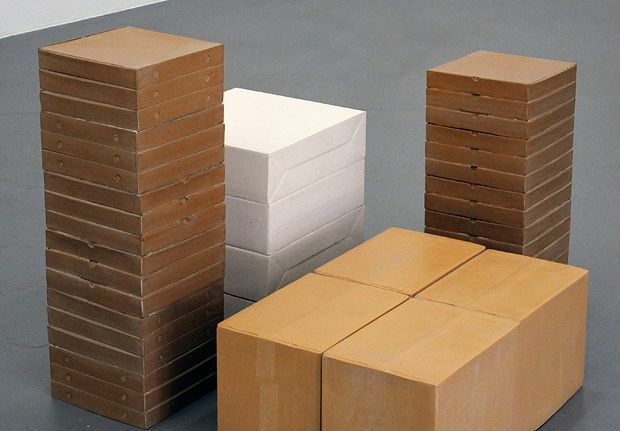 Hunter argues that sculpture's production of models and casts lends itself readily to the creation of multiples and blurs the distinction between original and copy. He says, 'within the field of sculpture reproduction has always been present and key to its development'. His work, Two Identical Forms, 2016 fits neatly with this argument, where a white plaster cast and a bronze sculpture of the same model sit side by side. Hunter also explores the possibilities of digital processes, stating, 'the immateriality of the digital object is perhaps the key issue to address here – it exists nowhere and is endlessly reproducible'. In Migration of the Aura (Endless Edition), Hunter has created a small and unassuming sculpture of a nuclear mushroom cloud, which is also available as a free download. He thereby opens his image up for reuse; a democratic approach to the sharing of imagery which is so prevalent in today's culture. Edinburgh Sculpture Workshop, until 24 Sep, free. New and reconfigured works, in the artist's first major solo exhibition since 2003.